Information: The folklore dance reveals sincerely and directly the aspirations and feelings of man; it is closely connected with life and history of people being man's faithful companion both in happiness and sorrow; it expresses at the same time the character, temper, force, keenness, wisdom, and humor of the people. Romania has a very rich and complex folklore treasure. The Romanian popular dances, known for their beauty and large variety, constitute this treasure together with songs, fables, legends, and popular poetry. Although the Romanian popular dance appears in a large variety of regional aspects, it presents essential characters in common, uniting all forms of choreographic expression of the Romanian people in a specific national style. The Romanian popular dance has always been a part of individual and community life; whenever important events occurred, song and dance played a prominent part. Such occasions are holidays, pastimes, markets, "nedeie" (a folklore festival characteristic of the zones of the Hunedoara and Banat), feasts in connection with farming or herding, ceremonies in connection with labor and earth fertility, and, naturally, important events of life: birth, engagement, marriage, even death. Dance is never separated from music. Before being accompanied by instruments, dance was accompanied by songs and the rhythms of clapping hands or percussion. This kind of dancing is going on today in some ritual dances for men and women. Romanian choreographic folklore belongs to the great family of Balkan-Carpathian dances. There is a great richness of rhythms and tempos; the elegance of the lyric movements of the dances for women joins the vitality and virtuosity of the dances for men. A series of well-outlined technical elements determine a distinct national character. Steps with large movements, small steps in place, rapidly changing steps, groups of eight to sixteen successive steps, tapping steps, even-tempo steps, syncopated steps, all combined in small or large movements in all directions to create a tremendous variety of choreographies. Additionally, the intensity of stepping (stamping) on the floor increases the variety of rhythmic nuances. Other steps include crossing steps, spurs on the floor or in the air, a whole series of leaps, running jumps, steps on tiptoe or on heels, steps on the ball of the foot or on the full sole, lifting feet in the air at different heights, rotating feet in the air or on the ground, slapping boots or different parts of the legs, pirouettes on the heels (performed by women), snapping fingers, et cetera. There is a great variety of regional styles with pronounced character, conferring personality on the different folklore regions of the country. The folklore regions cannot be strictly delimited by the specific character of the dancing and style because many aspects overlap, but the local regions can be grouped geographically in larger regions corresponding to the ancient historical provinces. These larger folklore regions are Moldavia, Basarabia, Wallachia, Oltenia, Banat, Transylvania, and Dobrodja. To these regional styles, we add the Aromanian folklore of those people having the same origin but living south of the Danube river. Bordered on the west by the East Carpathian mountains and on the south by the Danube river, Moldavia constitutes the east region of the country, presenting in its turn various choreographic aspects in its north, center, and south. In the north, dance is accompanied by gentle swinging of the body. Steps are small, generally tapped, often in contra tempo, giving a continuous, jerky rhythm to the movement. Small leaps are also found, accompanied by spur clapping, specifically characterizing "Trilișești" men's dances. There are also many couple dances, generally known as "Bătute," having the same slightly leaping character to the pronounced rhythm of tapping steps. The dance that generally ends an event in this region is "Tărăneasca," characterized by "hora" rotation at high speed. It begins slowly with steps on the spot, then moves with large steps to the right and to the left, and when the tempo has increased, the large circle divides into little circles of four to six couples competing in virtuosity. Characteristic of the central region is the men's dance "Corăghiasca," including particular technical elements and a special rhythm performed in six measures. This is found especially in the Bacău region, while towards Jassy there is found a rich repertoire of stamping "sîrbe": "Sîrba de la Sticlăria," "Sîrba-n ciobânas," and "Sîba de la Flaminzi"
The south region includes dances like "Burduiul" of Vrancea, similar to the Bacău "Corăghiasca," but showing the influence of the Wallachia region. Musical accompaniment is supplied by folk bands, including: violin, kobsa (a type of guitar), trumpet contrabass (double bass), and portable cembalo (harpsichord). But often, dance accompaniment is supplied by specific instruments such as "trișca" (a kind of short pipe), "fluierul" (shepherd's flute), and "tilinca" (shepherd's pipe). This region stretches to the east of Moldavia, comprising the territory between the Prut and Histru rivers. It was occupied by the USSR after the Second World War and gained its independence in 1991. The folklore here is related to that of Moldavia, but in the southern part, it is closer to the folklore of Muntenia and Dobrodja. There are "hore" and "bătute" (dances with many stamps and syncopations), as well as men's dances such as "Brâu" and couple dances similar to those of northern Moldavia. Situated in the south of the country between the Carpathian mountains and the Danube river, Wallachia includes regions of varied repertoire; there are villages with 20, 30, even 40 different dances. Most of them are mixed dances, but there are also dances for men and dances for women. The most frequent formations are the circle and semi-circle. The richness of rhythmical steps is very large; syncopation and contra tempo are frequently found. The most representative dances in Wallachia are the "Hore," the stamping "Hore," and the "Sârba." There is a great variety of "Brîuri" for men and women, the principal steps of which are performed in six or eight measures. There is also found on the Danube plain a specific dance performed in five measures, the "Bugeac," which is accompanied by pronounced body swings, giving a special charm to the style of this south region. In this region is found the "Călușul," a dance also found in the Oltenia region. This is one of the oldest Romanian popular dances. It seems to have originated from a ritual dance included in traditional spring customs designed to drive out disease. The seven, nine, or eleven dancers (it should be an odd number) led by a captain, assisted by a standard bearer and a masked person (the mute), are "armed" with cudgels, have spurred footwear with bells attached, hats adorned with belts, gilded spangles, and glass pearls. The dance consists of a great number of figures ("more than fifty" Franz-Josef Sulzer noted in the 18th century) alternating with a walk in a circle for resting. The figures are shown by the captain and imitated by the group, and humorous extemporary verses continue throughout the dance. Nicolas Isthvanffi mentions the "Călușari" in 1572 when performing at the court of Austrian emperor Rudolf II, and chronicler Dosza Daniil mentions a one-hundred "Călușari" show performed at Piatra Camprei near Alba lulia on October 15, 1599. The oldest musical notations of "Călușari" are in the Joan Căianu Codex (17th century), and Franz-Joseph Sulzer (History of Transalpine Dacia) offers them in the following century. The folk music bands accompanying the dance in Wallachia usually consist of violin, panpipe, kobsa, cembalo, contrabass, and often they include the "fluier" (whistle), bagpipe, and "caval" (long shepherd's pipe). Adjoining Wallachia in the west between the Carpathian mountains and the Danube river, Oltenia includes a choreographic folklore with a numerous and varied repertoire. Oltenia dances are vigorous, rapid, requiring talent and virtuosity. Quick movements in large spaces, sudden direction changes, crossing steps, beatings and syncopations, swinging feet and spurs, all make up the characteristics of the Oltenia style. In this region there are women's dances full of grace and gentleness: "Crăițele," "Mîndrele," Ițele," and "Leana." Men's dances require virtuosity: "Galaonul," "Brîulețul," and "Trei păzește." There is an endless series of mixed dances: "Rusteme," "Alunele," "Ca la Baltă," "Sîrbe," and "Hore," as well as compound-beat dances with seven and five measures alternating: "Șobolanul," and "Dianca." Dances are accompanied by a folk music band consisting of violin, kobsa, cembalo, contrabass, and sometimes guitar. In the south-west of the country, Banat forms a distinct folklore region. The characteristic style of Banat includes steps in demiplié (where the dancer bends the knees halfway, keeping the heels securely on the ground), dancing on the balls of the feet, rotating the feet in the air and on the ground, and successive crossing with short leaps on the supporting foot. The dances that reflect these characteristics are the Banat "Brîulețe," often named for various performers, "Brîul lui Vlădia," "Brîul lui Paica," Brîul lui Snop," "Brîul lui Megheș," or after the places where they are performed, "Brîul de la Mehadia," "Brîul de la Vălișoara," "Brîul de la Marga," and "Brîul de Armeniș." Characteristic of these "brîuri" is the 7/16 rhythm, also found in other dances of this region. Besides "brîuri," there are "hore, "ardelene," "jocuri de doi," "poșovoaice," "iedire," and one of the complex men's dances, "Sorocul." Characteristic of the couple dances is a multitude of arm positions, bringing about interesting and ingenious positions of the partners. There are also dances for one man and two women, amplifying the characteristic Banat elements of the "joc de doi," the boy passing the women under his hands, performing "învîrtite" first with one and then with the other, and turning around in ingenious combinations. The composition of the accompanying folk music band changes in Banat. Instead of violin, viola, cembalo, and contrabass, the orchestra is composed of wind instruments; one will always find the "Taragot" (an instrument with a conical tube similar to the oboe and a single-reed mouthpiece of the clarinet), an instrument with a very popular sound. Western Transylvania includes the interesting region of the three Crish rivers. Dances of the region are characterized by syncopated rhythm appearing in many choreographic variants and created by accent changes. These generally are couple dances, the partners starting with the same stepping; the woman maintains the base rhythm while the man continues evolving interesting combinations of spurs and syncopated tappings, clapping hands, and slapping boots. Northern Transylvania includes the picturesque folklore regions of Oaș and Maramureș, where the unique small trampling steps transmit vibrations to the whole body and thus convey a distinct personality to the style. Characteristic dances are: "Roata oșenească," "Tropotita," and "Bărbătescu maramureșan." Central Transylvania includes the Someș and Mureș valleys, where dance choreographies attain a high level of virtuosity. There are not as many dances in this region as in the southern regions, but in the dance structure there are many figures of uncommon technicality and endless variety. The dance series begins with a "De-a lungul," a slow and elegant dance, sometimes compared to the gait of the proud peacock whose feathers the lads use to adorn their hats (the Măsăud region). This is generally followed by two dances for men: one of a moderate tempo, "Rarul," the second a fast one, "Jocul fecioresc," dances where leaps, slaps on different parts of the legs, spurs, and spins combine in a variety of forms. The dance usually closing the village "hora" is "Învîrtita," where two or even three pirouettes on the heels are unhesitatingly performed by the women, and the men compete in dance virtuosity. The south of Transylvania offers some interesting 7/16 and 10/16 rhythms in "Purtate," and "Feciorești." The characteristic elements of the central region are diversified into a greater variety of rhythms. In this region, besides "Purtată," "Feciorească," and "Hațegană," reminiscent of the dance series of the central region, there are also found the usual dances of the Carpathian mountain southern slope, such as "Brîul," "Jiana," and "Mocănească." Striking coincidences are to be found not only on the opposite slopes of the same mountain chain, such as the south of Transylvania and the north of Wallachia, but also at great distances, such as in Oaș and the dance "Mărginimea Sibiului." The melody accompaniment is principally supported by violins seconded by violas and contrabasses. Cembalo and clarinet are sometimes used. The Dobrodja region is situated between the Danube river and the Black Sea. Typical dances are the fast "Brîuri" for men, "Hora pe bătaie," reaching a high level of virtuosity ("Hora la doua" of Făgărașul nou), and dances performed in measures of 5, 7, 8, and 11 beats, such as "Drăgăicuța," "Geamparaua," "Cadîineasca," "Păhărelul," and "Păpușica." The musical accompaniment is similar to that of Wallachia. 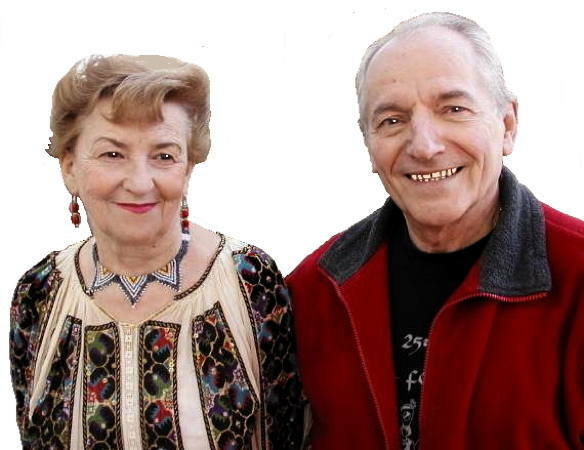 Living in the middle of the Balkan territory, in Greece, Macedonia, Albania, and Bulgaria, the Aromanians, known also under the name Vlahi, speak a Neolatin language in a dialect close to the Romanian language. They have the same origin as the Romanians, being the descendants of the Romanian empire. Their songs and dances reflect the populations among whom they are living, but retain some distinct features. Their dances may be classified within the Balkan area from which the rhythms of 5/8, 7/16, 9/8 are not missing. But the customs perserved today reflect ancient Roman and pre-Roman traditions. For instance, the ritual of the "Călușari" dance is preserved in forms which are very close to those practiced by Romanians from north of the Danube river. In Romania, dance is associated with poetic creation. During the dance, men and women chant "strigături" (impromptu verses), which differ from one region to another. In Moldavia, verses are chanted jerkily in rhythm with the step. In Oaș and Maramureș, they are chanted with specific, interesting intonations called "țîărituri." In the center and south of Transylvania as well as in the Crișana territory, real dialogues pop up between men and women. In Oltenia, Wallachia, and Dobrodja, these chantings play the part of leading the dance by announcing figures. The "strigături" contain now a lyric, now a love text, now a satirical, humorous one; but no matter how they are done, they are not absent from any choreographic style. In the general description of Romanian dance, the women's dances complete the rich choreographic folklore palette by adding an undoubted degree of artistic refinement. It is enough to mention here the dance of the women of Căpîlna (Central Transylvania) performed with nobility and peerless grace and accompanied by their own singing. Not included here is discussion of agricultural ritual dances such as "Drăgaica," "Cununa," "Căiuții," "Caprele," "Ursul," or death watch dances and mask dances of Vrancea. As evidence of long traditions, each of them might be the object of detailed studies. We hope this general summary will encourage interest in more detailed knowledge of the character of Romanian folk dance. 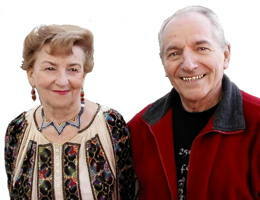 Theodor & Lia Vasilescu, an article.